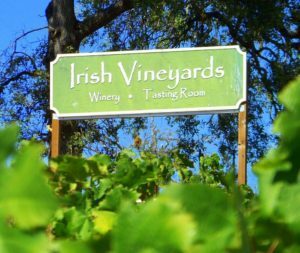 Here in Vallecito dreams have always been big… so has the Irish influence. First to hit the area were the Murphy boys back in 1849. John and Daniel came looking for gold and found it One hundred and fifty years later we discovered it here too. I am Russell Irish of Irish Vineyards. Our gold comes in liquid form, and unlike those 19th century mining Murphys we are delighted to share our riches with everyone. A renegade spirit pulses through our award winning wines. Making wine since before he was old enough to drink it Russell’s dedication is discernible through every sip. Never losing the integrity of the wine he always pushes the limits of viticulture. With both estate grown grapes and those grown to our specifications he has created such mouth welcoming joys as Alacant Bouchet and Chenin Blanc. We also guarantee you will taste much more. Whatever the varietals from our Petite Sirah to the Pog Mo Thoin our sense of fun and family permeates in each bottle. For us there is no snob appeal in our wines. Instead we think of them as elixirs to the good life. The wines from Irish Vineyards add a fluid celebration to any occasion. Come share the wealth with us! 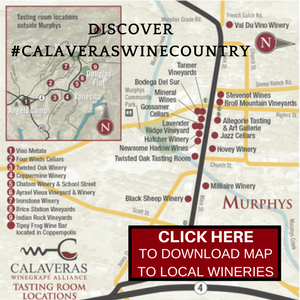 Join us to experience the finest in Calaveras Wines. Check out our tasting rooms in downtown Murphys (263 Main Street next to Taste of Robs) AND Vallecito (2849 Highway 4).